This is the official photo of Kyle Carpenter that will be included in the Pentagon’s Hall of Heroes exhibit featuring Medal of Honor winners. In this exclusive video, Kyle Carpenter talks about life as a Marine under fire in Afghanistan. 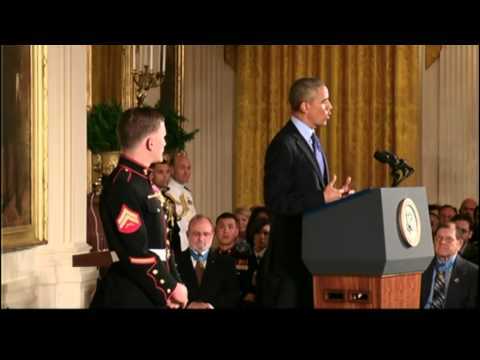 Watch South Carolina's own Kyle Carpenter receive the Medal of Honor in a White House ceremony. Kyle Carpenter will receive the Medal of Honor from President Barack Obama, June 19, 2014. He will be the eighth living recipient of the Medal of Honor for actions in Iraq or Afghanistan. Kyle Carpenter (right) with fellow Fox Company Marine Jake Belote at Patrol Base Dakota the day before Carpenter was wounded. On patrols in Afghanistan, Kyle Carpenter and his fellow Marines often used rooftops as security posts. Rehabilitation from the extensive wounds he received in Afghanistan was a slow process. At first, just sitting up was a challenge, but Carpenter attacked his recovery with the determination of an athlete by setting incremental goals for himself. His confidence soared when he completed the “bell lap,” one complete walk around his hospital floor, cheered on by his fellow wounded warriors. Although Kyle Carpenter completed his physical rehabilitation before medically retiring from the Marine Corps in 2013, he still makes time for the gym nearly every day. Skydiving, running adventure races and traveling the country were part of Carpenter’s recovery process, documented on the Operation Kyle Facebook page. Since medically retiring from the Marine Corps, Kyle Carpenter has learned to appreciate the simple things in life, including time playing with Ace, his family’s black lab. Even in a war zone, Lance Cpl. Nick Eufrazio (left) and Kyle Carpenter could find humor in their situation. “We were getting shot at, but Nick kept making me laugh,” Carpenter wrote of this photo on the Operation Kyle Facebook page. Kyle Carpenter, armed with an M4 rifle, guards a CH-53 supply helicopter delivering food and water to Patrol Base Beatley. The arriving aircraft always attracted enemy fire. “You’re getting shot at, but the bird is so loud you can’t really hear it,” Carpenter says. Like generations of Marines before them, the men of Fox Company bonded together in the harsh realities of combat deployment. “Over there, each other is really all you have,” Carpenter says. “We were in good spirits. We really cared and looked out for each other.” From left to right, Lance Cpls. Brad Skipper, Jared Lilly, Griff Welch and Nick Fitzpatrick. Are Some People Genetically Wired to be Brave? When Lance Cpl. Kyle Carpenter’s squad began setting up a forward patrol base in a mud-wall compound near Marjah, Afghanistan, the battle-hardened Marines had no illusions about what to expect. It was Nov. 20, 2010, and since arriving in the Helmand Province more than four months earlier, the men of Fox Company, 2nd Battalion, 9th Marines, had been engaged with Taliban fighters almost daily. Loaded down with supplies, weapons and ammunition, the 10-man squad hiked into enemy territory near a trio of villages dubbed Shady, Shadier and Shadiest, Taliban strongholds where the insurgents fought from the shadows and blended in with the local population. The attacks on their new base started almost as soon as the Marines arrived. Two of Carpenter’s buddies were wounded by grenade fragments and evacuated by helicopter on the first day. Carpenter manned the security post atop a corner of the compound. With Taliban snipers targeting his position, he kept his head down, staying as low as possible while building a sandbag wall around a machine-gun emplacement. The squad worked through the night filling bags and tossing them up to the roof. The following afternoon, Carpenter and Lance Cpl. Nick Eufrazio were on post behind the defensive wall when an enemy grenade landed on the rooftop and their lives changed forever. The Marines inside the compound heard the thud of the grenade landing on the roof, followed by scuffling. Then the blast cracked the ceiling of the room. The men inside immediately climbed to the roof, where Lance Cpl. Jared Lilly and hospital corpsman Christopher Frend—the first to arrive—saw a horrific scene. Carpenter had taken the brunt of the grenade and was lying atop the still-smoking blast zone. The explosion and resulting shrapnel had blown away most of the Marine’s jaw and teeth, and he was bleeding profusely. There was massive trauma to his right arm—severe tissue damage and more than two dozen fractures—as well as damage to his right leg and his right eye. Eufrazio was also hit by shrapnel, the most destructive fragments lodging in his brain, causing debilitating injuries that still affect him today. Carpenter’s last conscious thoughts were of the warm liquid flowing from his wounds, his fear of disappointing his parents, and “making my peace with the man upstairs. I knew I wasn’t leaving Afghanistan alive,” he says. He was almost right. Carpenter nearly died three times during the next 24 hours as triage medics and doctors raced to keep him alive and patch his body back together. For his actions that day, Carpenter was nominated for the Medal of Honor, the nation’s highest award for valor. But even after the Marine Corps Times reported in March that he had been formally approved for the commendation, it wasn’t something the 24-year-old University of South Carolina freshman talked about much. Born in Jackson, Miss., Carpenter moved with his family to Gilbert, S.C., during his junior year in high school. He played varsity baseball and football at W. Wyman King Academy in Batesburg-Leesville, graduating in 2008. In March 2009, he enlisted in the Marine Corps and completed basic training at Marine Corps Recruit Depot Parris Island. 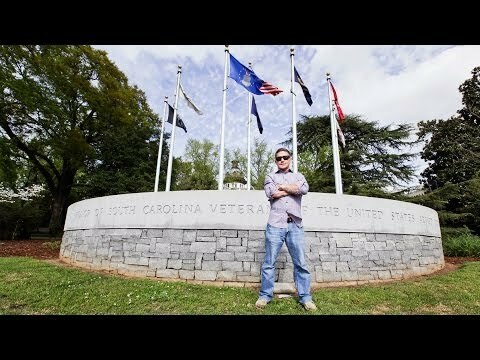 Carpenter credits his family, his faith and the support of thousands of South Carolinians for seeing him through the long road to recovery, a journey that began when he first woke up in Walter Reed Army Medical Center four weeks after the attack. His mom, Robin Carpenter, still has trouble talking about the moment she first saw the extent of her son’s wounds. For months, she put her life on hold to be by his side. His initial recovery took place at military hospitals in Maryland and Virginia, and the long drives gave a worried mother a lot of time to think and pray. By mid-February 2011, Robin Carpenter was getting over the initial shock of her son’s injuries. One of Carpenter’s fondest memories of those difficult early days is of his mom and her aversion to snow. “Mom hates cold weather, and every day I was awake in the hospital, she would walk through the snow across the base to get me a vanilla milkshake, because it was the only thing I could taste,” he recalls. Maybe it was the milkshakes that helped Carpenter through the pain, the drugs, the therapy and the fear of those early months in recovery. At first, just sitting up without vomiting was an achievement. Slowly, day by day, to the bathroom 5 feet away. The next objective became the door of his room, then the hallway, then the nurses’ station. After months of care, Carpenter made his first full lap around his hospital ward—the bell lap. Cheered on by the staff and the many other wounded warriors on the floor, it was then that Carpenter believed he was going to make a successful recovery. Today, Carpenter is physically active and strong—“ripped” would be an accurate description of his physique. While he completed formal physical rehabilitation before retiring from the Marine Corps, he still spends time in the gym nearly every day, using modified workouts to adjust for injured and rebuilt joints. Adventure travel and physical challenges have been part of his recovery process. Carpenter has completed a 6.2-mile mud run obstacle course and made a tandem parachute jump (“I hope to eventually become jump certified. Just one more thing to drive Mom crazy,” he says), and last fall he completed the Marine Corps Marathon. Along the way, he kept friends, family and supporters updated through the Operation Kyle Facebook page, set up on his behalf by friends at Lexington Baptist Church, and via his Twitter feed. His post-marathon tweet was typical—humble and full of gratitude. “When you fully experience death and you get a second chance to come back from that—in my opinion, I don’t really feel like I have a choice but to live life to the fullest, plus some,” he says. What of the proverbial “elephant in the room”—the Medal of Honor? When the president hangs the powder-blue ribbon around Carpenter’s neck, the retired Marine will become the youngest living recipient of the Medal of Honor and the 38th recipient from South Carolina. He will join an elite group of fewer than 3,500 men (and one woman) who have earned the commendation for valor since 1863. And as happened on Nov. 21, 2010, in combat, his life will once again change forever. The Marines who served with Carpenter have made it clear that he deserves the Medal of Honor, and like many of the recipients before him, Carpenter understands the enormous responsibility that comes with the commendation. Awarding the Medal of Honor—Military historian Dik Daso takes us behind the scenes of the June 19 Medal of Honor ceremony. Local heroes—Learn more about the five South Carolina Medal of Honor recipients honored when Charleston hosted Beyond Valor, the 2010 Medal of Honor Convention. S.C. Medal of Honor history—Learn more about the state’s deep connection to the military’s highest award for valor. Heroism on display—Tour the Medal of Honor Museum at Patriots Point Military Park in Mount Pleasant.